One of the challenges I have as a mom is finding healthy on the go "cracker style" snacks for my toddler that he actually likes. Let's be real, he is not totally stoked when I pack him a little baggie of trail mix when all his friends are eating Cheez Its and Goldfish Crackers. Tradsies anyone? So I have given in from time to time and bought boxes of crackers and I am pretty sure he might be turning into a cracker-aholic so I have decided to cut back on those processed little snacks. Yesterday I decided to give homemade cracker making a shot. I always imagined making your own crackers wold be a long time consuming project, that only those Martha Stewart type Moms would attempt but I was so wrong. This was a breeze! Plus making your toddler a happy little camper is pretty awesome as well. I found this recipe and made a few small changes and I can not believe how good and "Cheez It" like these taste! Combine all the dry ingredients together. Mix together the lemon juice and egg. Add the lemon juice and egg to the dry ingredients. Stir in the melted coconut oil or butter. Mix well until dough forms. 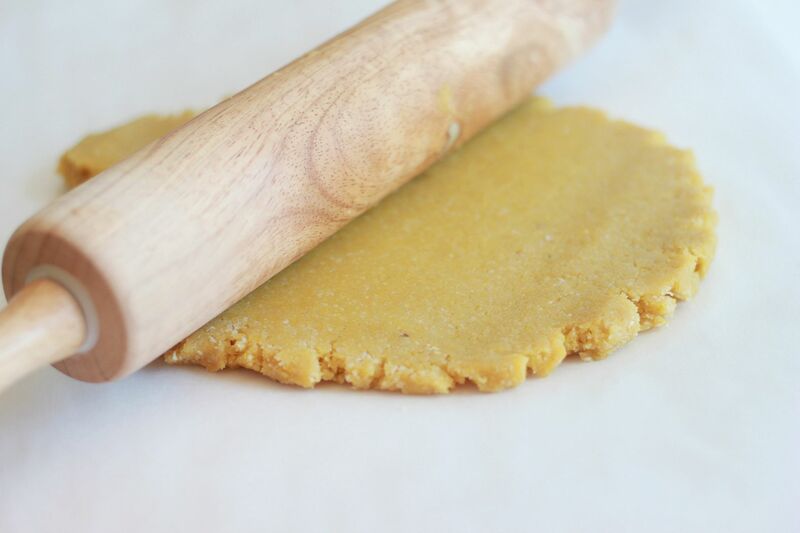 Place the dough on a sheet of parchment paper and using a rolling pin roll the dough until it is about 1/8 inch thick. 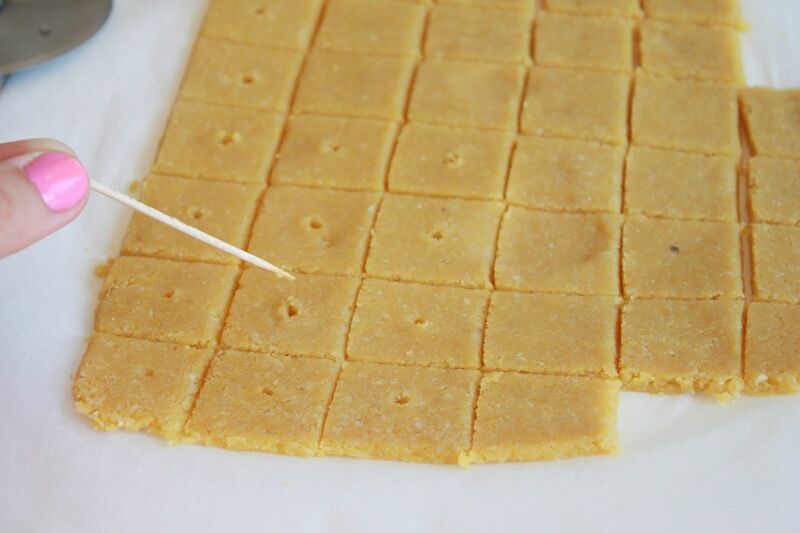 Using a sharp knife or pizza cutter, cut crackers into desired size. 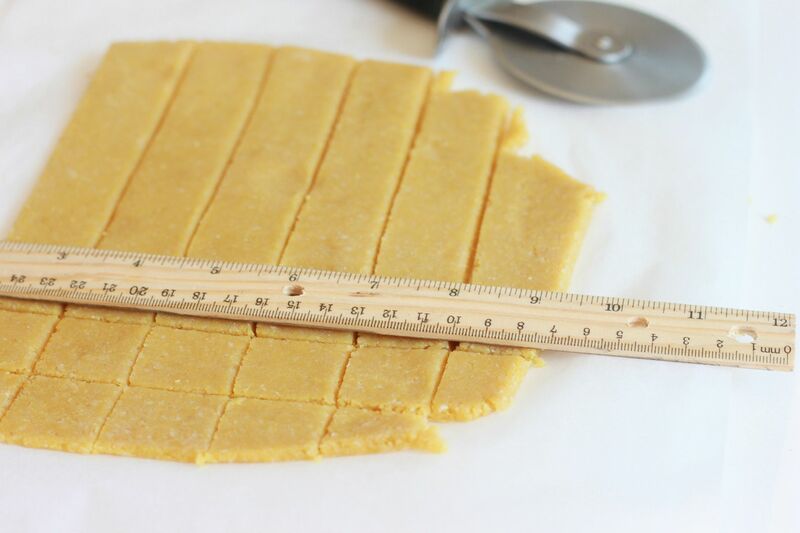 Using a ruler will help if you want to make them all the same size. Use a toothpick to poke holes into the middle of each cracker. 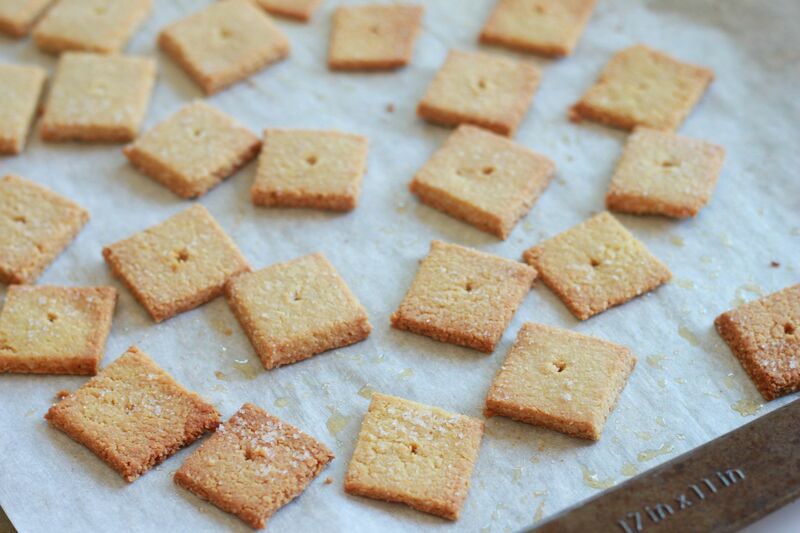 Sprinkle a little sea salt on top of the crackers. 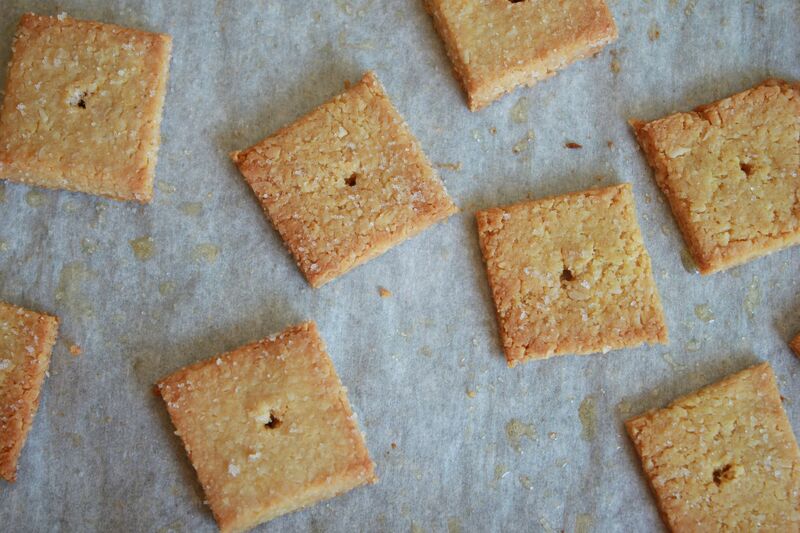 Place the parchment paper with the crackers onto a cookie sheet. Bake for 20-25 minutes. Keep an eye on the crackers and since the outer crackers will be done faster than the ones in the middle remove those one and keep baking the others until they are nice and crispy. I made a second batch (Max LOVED them so much) and in the second batch I used olive oil butter and they tasted even better. The thinner you roll the dough the better they will be. 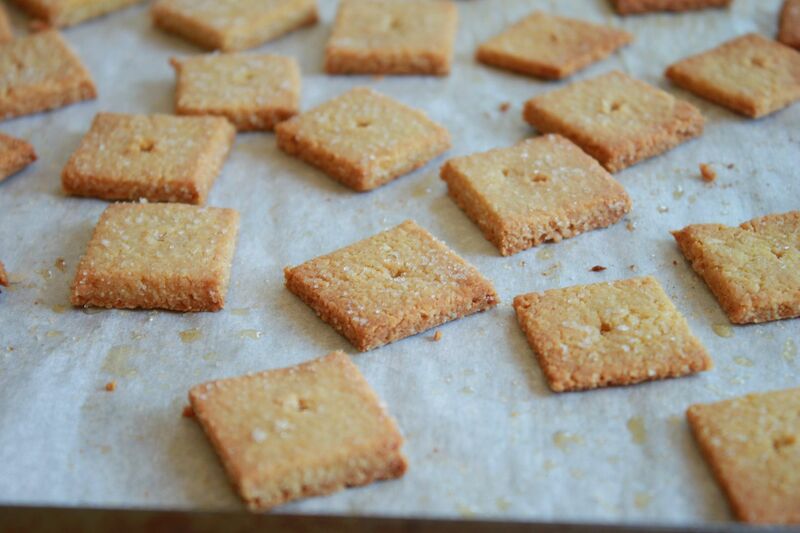 The browner and crispier crackers were the best so if you need to bake them a little longer do so. The real taste tester for these babies was my son Max (he is almost 3). He loved them! He loved them so much I made a second batch so we could have more for the rest of the week. Is nutritional yeast the same as brewer's yeast? These look awesome. omg! i stopped eating crackers and cheese its! this is an amazing replacement!!! thank you! Jen- nutritional yeast is not the same as brewers yeast. I just added a link above in the ingredient list, which explains what nutritional yeast is :) And thank you! The few things I really miss about trying to stay on my paleo diet is cheesy crackers. Something about a mouthful of dry cheesy flour crackers just makes me happy. Will definitely be trying this! Thanks for sharing! I'm looking forward to making these, but -- may I ask where you got the almond meal from, please? Thanks!!! Cheesy crackers have been my downfall during pregnancy. Maybe if I made these I wouldn't feel so guilty about eating them! These look awesome! I am going to make some to put my goat cheese spread on! Yum! So going to make this! About how many crackers does this make? Just made a batch of these... they are truly delicious! I want to play around with the recipe a little and try to make some rosemary/olive oil ones. Thanks for sharing! Those sound yummy! I made a paleo cracker with rosemary, pizza spices and garlic when we did 30 days of paleo and they were so Good! I might have to make them again! The only thing is they only tasted fresh for like 2-3 days tops (not that they lasted longer then that!) but I would like to make a bigger batch to last longer! You seriously amaze me! Do you think these would work with real cheese in place of the nutritional yeast? A healthier cheez-it? I'm in! Her snicker doodle recipe is AWESOME! My whole family loved them! did u try freezing these? woukd that work or woukd they sog..? im making a batch right niw with olive oil, wish i had have read the comment about the rosemary first. sounds great. ok, these taste sinful..lol..im in big trouble cause i wanna eat the whole pan. they remind me of pretzels. my son liked them too. tyty! I know it kinda defeats the purpose, BUT, if you were to use flour instead of almond meal (which costs a fortune here! ), would you need to increase the coconut oil/butter quantity? Found some nutritional yeast, and I'm busting to try these and the cauliflower poppers! Made this recipe today...substituting lime juice for lemon juice (which was all I had!). They turned out fantastic! So tangy, cheesy and salty. Exactly what I was craving. I can see make these into little goldfish or stars or whatever shape kids like too. anyone use a dehydrator for these? Can you use regular dry active yeast? I want to make these and I don't have or know what nutritional yeast is. If not, is there a sub for it? Just wondered if these can be made with active dry yeast? I don't have nutritional yeast and I want to make them today. Can I sub it with anything else or leave it out? Are these the same carbs as the others? Cracker making tip: Since you liked the crispier ones... Bake the crackers at 400 till they just barely begin to get brown at the edge. Take them out to cool if needed (so you can break them apart into individual crackers) Then leave them in the oven on a tray (in piles is Ok) at 150 for an hour or two, to dry thoroughly, stirring the pile occasionally. Makes nice crispy crackers.